The canary in the coal mine that shows that the Pacific Ocean is in serious trouble, are ....not birds, they are Squids. "We're seeing a new world here, one we haven't seen before. Any time you push an ecosystem into a different state, there's greater uncertainty in how it will behave, and how it will respond to future changes. Frankly, I think that should make people really worried," Ben Halpern, a biology professor at the University of California, Santa Barbara's Bren School of Environmental Science and Management and director of the school's Center for Marine Assessment and Planning tells the Monitor in an email. So Ben seems to have his head screwed on straight, but then he goes on to blame "overfishing". 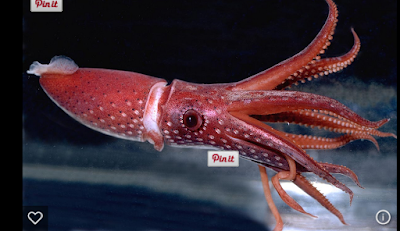 Ben Halpern, who teaches biology at the University of California, suggested that overfishing has led to more cephalopods because humans have been constantly taking out sharks, swordfish, and tuna, among other large predators, before removing smaller species. The fact that people usually fish down the food chain and global fisheries can overfish due to wrong management results in tremendous amounts of prey, including cephalopods. And then in the totally morally and intellectual and financially bankrupt UK, they immediately jump the shark so to speak and blame "global warming" for all the squid. Yep those sociopaths care nothing of the number of people they pretty directly murder. Cancer related deaths haven't been validated as caused by nuclear exclusively. There is no smoking gun. Just statistics that can be manipulated as Mangano, Yablokov, and others would want you to believe. They are battling for your heart and mind with no avail to those of us that approach the issue with more common sense. I amcasually feel sorry for antinukes like you that bought into this claptrap without questioning methodology, data validation, and just plain "passing the ho ho test". Michael Marriotte, the prolific antinuclear activists passed away from pancreatic cancer. Was that nuclear related? The onus is on those that believes that to prove it, not vice versa. Same with any life. Is nuclear the cause of any cancer when coal fly ash is more radioactive than Fukushima dirt? Think about that one. It happens to be true. Loose Nuke. Your twisted thinking is there for all to see "The onus is on thos that believes that to prove it, not vice versa." Cobblers. So I can release chemical poisons into the atmosphere next to your house, willy nilly, and the onus is on you to prove it is harmful? Don't talk daft. Can't prove it was nuclear that gave u luekemia and your kid thyroid cancer! No one has died from Fukushima either. The animals are thriving at Chernobyl. Nuclear is totally safe and economical. Yep, once you study the industry ( or the cartel as I like to call it), you see that it is based on lies out of the gate, and a continuous string of lies, false arguments, minimizations, and attempts at deceit. Then there is also the "true believer" blinded by science types. Sheesh! If you can't prove it, then any other claim is just not worth the time of day. Why make crap up? Coal fly ash is more radioactive than Fukushima dirt. The data supports that assertion. A cartel? Give it a rest. It's big oil, gas and fossil that manipulate public opinion on nuclear. Think about it. What industry best benefits from nuclear demise? Sounds like you are a Naomi Klein disciple and just hate capitalism on principal. People are not going to give up their conveniences for the social environmental agenda. The facts are that energy demand is correlated to both population and modernization. Yoy can't see a world where energy sources exclusively from solar and wind are going to sustain modern high quality of life and move those countries that want more for their people. Why do you think they want nuclear energy? The UAE is a perfect example. Think about their decision making that lead them to build 4 Korean nuclear plants that are basically a Westinghouse design. Why was the US shut out? Nuclear is bigger than you or me and will continue to contribute to modernizing countries that are not on some Socialist Green Party agenda. I've studied the industry for 40 years. You're a Johnny come lately that really doesn't know where the bones are buried. It's us insiders that really know what's going on with the technology. Maybe you need to look at what the equivalent technical society to ASME, IEEE, view. Do you know that organization? It's no more a mouthpiece to nuclear as ASME, ASTM are to their industries. Learn the inner workings and why regulatory dynamics in 2016 are shaped the way they are. You often say NRC is a captive regulatory agency yet you give the FAA a free pass even after disasters that kill thousands annually. These are not statistical deaths drawn from flawed application of LNT. These are real people that died. Same for the 20k who died on 311. Who weeps for them? Surely no antinuke. They would rather you believe thousands are dying from Fukushima, when the dirt around town is less radioactive than coal fly ash. The Duke study is a damnig indictment to any antinuke or rat farm claim. Before the nuclear era, there was no strontium in teeth, no caesium in wine, no plutonium in testacles and cancer lifetime risk was a fraction of what it is now (50% and rising). I wonder what they were using then. Maybe we should go back to it. Oh, wait a minute, it was coal, wasn't it. Guess your rambling post does not amount to much then.